I have embroidered “free hand” before, so I was familiar with cross stich and a few other stitches. with Jessica Marquez”.This is a great resource, and has been a great guide to me. The greatest obsticle for me was the “satin stitch”. To begin with I either added too much yarn, or got the stitches irregular. I was quite nervous starting this project, because it is so enormous, and the fabric I am embroidering on is super expensive!!! This is the council I can give others who are starting out. 1. it is a good idea to sew the stitches so they look like they are going in the same general direction. Specifically I am thinking about leaves and other small fill areas. 2. In curves, changing the direction gradually looks best. 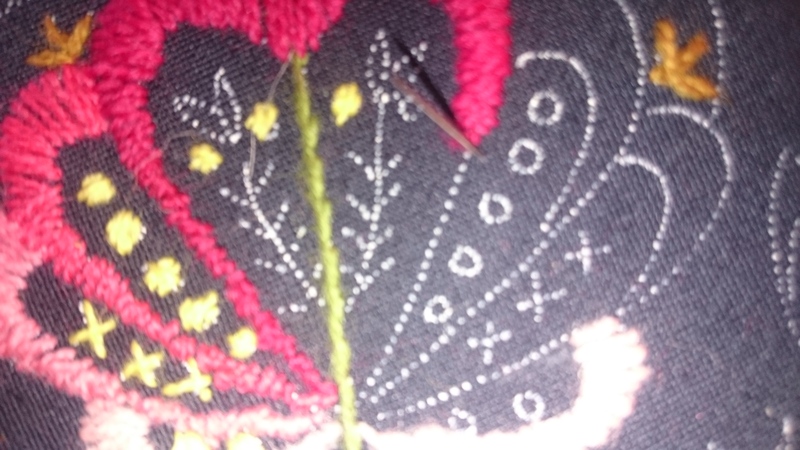 I am including a photo, showing how I sew a stitch ahead, to help me estimate what I need to do in-between. (this is what seems to work best for me)! 3. In the “bunad store”, where I bought the fabric, the woman suggested that it often is easier to work with a motif if you start in the middle area. Like a rose bud, etc. then work to the sides in an even manner. 4. A friend of mine said that she did not use more thread then she felt was necessary to cover the area she was working on. This is probably a good idea so you avoid bulk, but I try to make sure that the thread covers what it needs to!! !A friend of mine said that she did not use more thread then she felt was necessary to cover the area she was working on. This is probably a good idea so you avoid bulk, but I try to make sure that the thread covers what it needs to!!! 5. when a line represents a area with satin stitches, I find that it is good to sew evenly one stitch on each side of the line. 6. In general, collect all the information you need using all the resources you have available to you is a good idea. 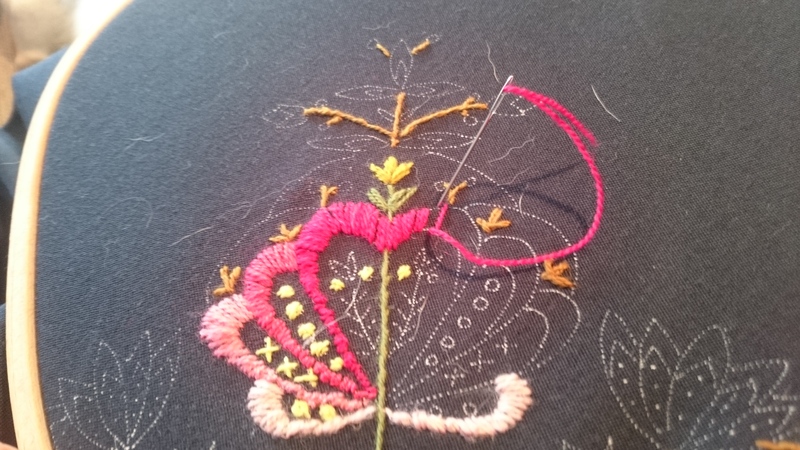 Initially I was very overwhelmed by this project, but believe it or not, now I am starting to relax with this embroidery !!! This entry was posted in Uncategorized and tagged embroydery basics, embroydery skills, Help when embroydering, Jelsa, Rogalandsbunad, satin stitch, Traditional norwegian dress. Bookmark the permalink. It looks lovely, I hope we’ll see the finished dress…. I can imagine! But I’m sure it’ll be worth it!